Players belong to one of 14 vampire Clans, and to one of two sects: the Camarilla, which styles itself as the aristocracy of the night, or the Sabbat, a death cult steeped in fire and blood. Camarilla players do not know who is in each sect, but the Sabbat infiltrators know which other players are on their side. The object of the game is to resolve Intrigues by bidding Trait cards which either add together or subtract from the total points needed as listed on the Intrigue card. The Camarilla wants to have enough points to win the Intrigue, but the Sabbat want the Intrigue to fail. After each Intrigue is resolved, Prestige Points are awarded to the players. The player with the most Prestige Points gain the Prince's Favor and gets to decide which Intrigue is next. 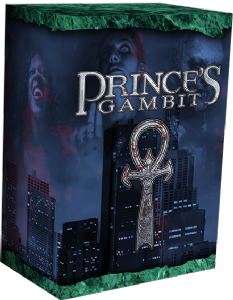 Play continues until the Camarilla win enough Intrigues to stabilize the city, depending on the number of players, or the Sabbat manage to cause three Intrigues to fail, causing the city power structure to collapse.